Microsoft Dynamics NAV is widely used in enterprises with its enhanced reporting features, but there still is not a book that covers reporting in depth, until now. This book will show you what’s possible and exactly how to develop reports for Dynamics NAV 2009. Learn why reports are designed in a specific way and then apply this knowledge to your advantage. 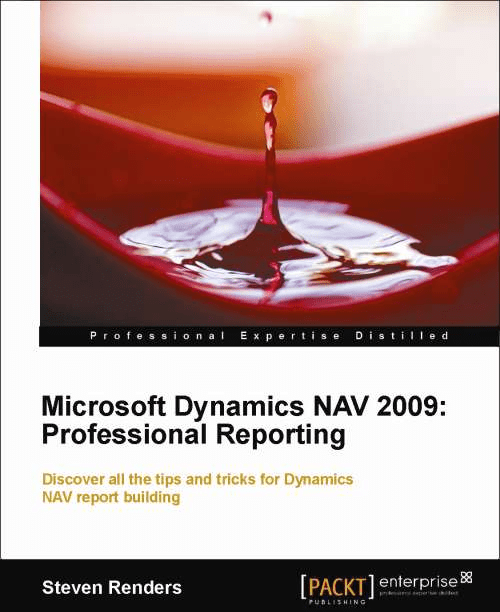 Microsoft Dynamics NAV 2009: Professional Reporting is an essential guide to understanding the effort involved in creating reports in Dynamics NAV 2009, and all of the available reporting possibilities. Reading this book will result in a better understanding and it will help you save time during development. The book starts with an overview of what kind of reports you can create without a developer using charts, dimensions, and analysis views. The next chapter will introduce the new architecture of Role Tailored Client (RTC) reports and the basics on how to create them or have them generated. Moving on we will discuss data visualization, where you will learn how and when to implement all the available Visual Studio controls. Document reports and other types of specific reports are covered next, and you will get to know all the best workarounds for getting them to work correctly. Knowing other related features is vitally important to obtain a helicopter view of all the reporting possibilities of Dynamics NAV, and the next chapter will introduce Business Intelligence concepts and available technologies that could be used in combination with the Dynamics NAV database. Technology is evolving rapidly and new versions of Dynamics NAV are in the pipeline, so the book will also provide you with a view to the future and how to prepare for it.